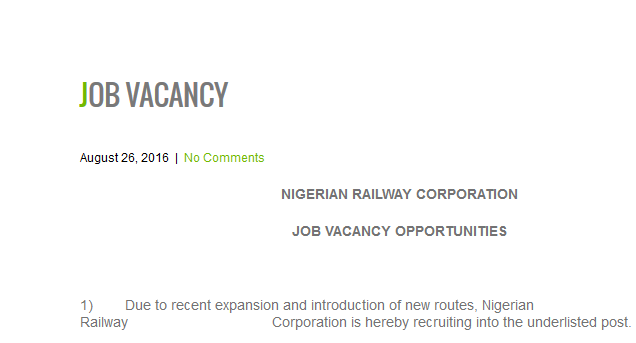 Nigerian Railway Corporation job Recruitment 2016; How to Apply now! This is to inform interested candidates that Nigerian Railway Corporation mass Job recruitment 2016 is currently ongoing. So, below are the JOB VACANCY OPPORTUNITIES available and how to apply. 1) Due to recent expansion and introduction of new routes, Nigerian Railway Corporation is hereby recruiting into the under listed post. Deadline for application is 18th September, 2016. 3) ONLY SHORTLISTED CANDIDATES WILL BE CONTACTED. For more information visit the official Nigerian Railway Corporation website or you can use the comment box below for your questions and comments. FG N-power Job recruitment ends today.